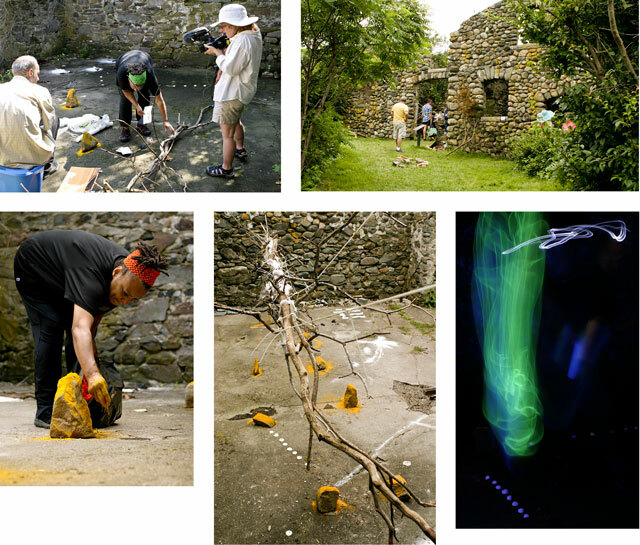 This summer Alice Apley and David Tames worked as collaborators and embedded documentarians with Sharon Dunn on her installation, “Dragonflies and Angel Wings” as part of the 2009 Bumpkin Island Art Encampment. The encampment took place in the Summer of 2009 and was documented in an exhibition that took place at Studio Soto at Thompson Design Group in Boston in October of 2009 as part of the Fort Point Open Studios. More details are available on the Berwick Institute site at www.berwickinstitute.org/bri/bumpkinisland. If you’d like to share feedback on this rough cut, please contact Alice through the Kino-Eye.com contact form. This page is currently in process and we’ll be adding to it over time, it will provide some documentation of the collaboration in the future. Stay tuned for more, but for now the rough cut of Traces is available as well as some photographs of the installation below. The “Traces” video documentary was directed by Alice Apley and produced by David Tames, featuring Sharon Haggins Dunn, with Kate Dodd, Mark Davis, and Kalmia Strong. Special thanks to the curators and participating artists. Photographs by David Tames.